For over 80 years, GIA has been making a difference for jewelers and jewelry professionals with its expert training and world-class professional credentials in diamonds, colored stones, pearls, jewelry manufacturing arts, and design. 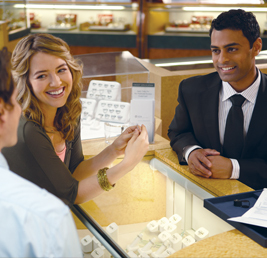 Today, GIA continues to help retailers earn customer trust and close more sales. Learn more about the coveted GIA Graduate Gemologist (GG) Diploma, the GIA Accredited Jewelry Professional (AJP) Diploma, and GIA's full array of diploma programs, lab classes, and online learning resources designed to keep you and your staff at your professional best.